Salads become soggy if they don’t get from kitchen to table on time. 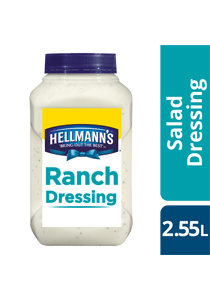 Our HELLMANN'S Salad Dressings provide exceptional coating performance for tastier salads. Coats & binds BETTER for a great salad experience! Pourable Dressing, multiple uses. HELLMANN'S Ranch Dressing is made with the flavours of creamy buttermilk, garlic and special spices. This smooth and creamy dressing adds flavour to any dish. Volume - 2.55 L. Volume per serving/portion - 40 ml. Coats & binds better for a great salad experience.